The former greatest NFL quarterback of all time Joe Montana, recently dethroned by Tom Brady, has announced plans to once again lend his name to a football video game franchise. His official Twitter page has confirmed the existence of Joe Montana Football 16 and announced that it will be using the Unreal Engine 4 to power its graphics. Montana has been teasing the game for almost a year now, but it now seems ready to show off in at least screenshots. 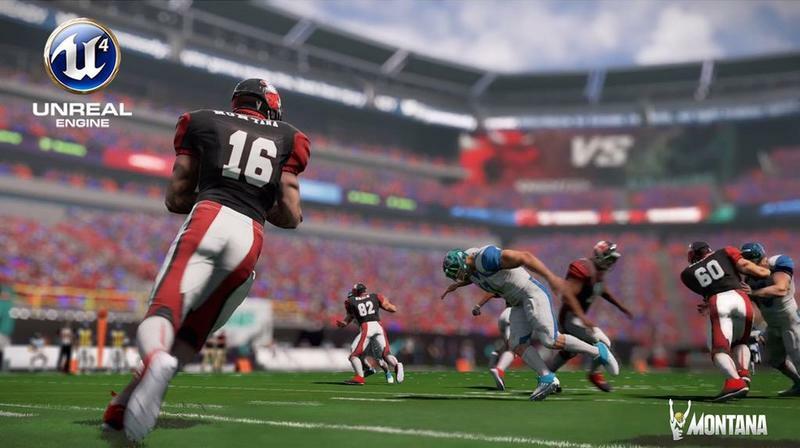 Of course, EA Sports and the Madden series still hold exclusive rights to the NFL license and all of its symbols and properties, so Joe Montana Football 16 will have to try and make due without any real world teams or players. Joe Montana Football was an early competitor to the Madden franchise in the history of NFL sporting games, and ironically, it was developed by none other than Electronic Arts! SEGA published it in 1990 for the Sega Master System, Genesis and MS-DOS, and Montana graced the cover for three more sequels developed by BlueSky Software until the 96 edition. SEGA continued the series until 2000 when it shifted to Visual Concept's legendary NFL 2K series. Oh NFL 2K… a moment of silence, please. This newest Joe Montana Football 16 will be the first "competition" that the Madden series has really seen since Visual Concepts took a stab with All-Pro Football 2K8, another game which lacked the NFL license. Sadly, I don't think it will make too much of a dent. That authenticity that Madden brings to the table is the reason many NFL fans buy into the series despite the possibility of better gameplay. Still, it's nice to have a little competition or outside influence to give the Madden team a few ideas on how to proceed with the following year's game. It will also be interesting to see how EA's Ignite engine holds up against the Unreal Engine 4. There is plenty of room for two football games in this video game world. No developer, platform, or publisher has been announced yet, so we will have to wait for further details. In the meantime, just remember, you have two options this coming year.